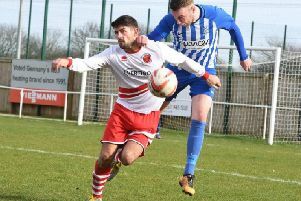 Skegness Town are still climatising to life in the Northern Counties East League, but boss Martyn Bunce is happy with the club’s progress. The Lilywhites manager admits that the standard of football and levels of competitiveness took him by surprise early on. But he believes that the newly-promoted side are gaining a foothold in Division One after making the step up from the Balcan Lighting Supplies Lincolnshire League. “It’s been going good. I must admit I think I underestimated the league,” Bunce told The Standard. “That’s not being disrespectful, it’s just a fact that the standard in the league is a lot better than I thought it would be. “Teams are really well organised and really well run. Bunce says the early exchanges of the campaign have been a learning curve, with the style of football in the NCEL very different to the United Counties League, of which he is more accustomed. “Comparing it to the UCL Division One, which is the same level, it’s different. The UCL has a lot of good young lads in it but this is a man’s league,” Bunce continued. “No disrespect there. But when we go to clubs like Selby, they have a much bigger area to pick players up from. “They can get players in from Leeds, Rotherham, Sheffield, York. “It’s a big difference to teams in Lincolnshire who don’t have anything like the catchment area. Town return to action on Saturday, travelling to Rossington Main (KO 3pm).